Riley was born in Ireland. Riley and his family lived on the Tarsus IV colony in 2246. In that year, a massive food shortage struck the planet, leading Governor Kodos to institute a eugenics program in which he personally selected 4,000 colonists to be executed, thereby ensuring enough food for the survivors. Among those killed were Riley's father and mother. By 2266, Riley was serving as navigator aboard the Enterprise as a lieutenant. In that year, Riley was one of the first crew members to fall victim to an unusual disease which caused those affected to act out and lose their inhibitions. Under the disease's influence, Riley commandeered the ship's engineering section, and rerouted all command functions there, prohibiting the rest of the crew from controlling the ship. This posed a significant danger to the Enterprise, as it was locked in an unstable orbit of the planet Psi 2000, and in the process of spiraling down towards the surface. Proclaiming himself "Captain Kevin Thomas Riley," he deactivated the ship's engines and regaled the crew with repeated renditions of the song "I'll Take You Home Again, Kathleen." Eventually, Captain Kirk and crew were able to regain control of the ship, and institute a full-power restart of the engines, narrowly avoiding destruction of the Enterprise. Later that year, Riley was serving in the communications department of the Enterprise. When Captain Kirk came to believe that an actor which had been brought aboard the ship was, in actuality, Kodos the Executioner, who had murdered Riley's family twenty years previously, he had Riley transferred back down to the engineering section in an attempt to keep Riley out of harm's way. 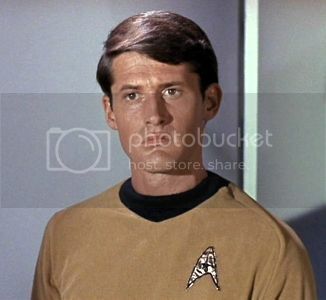 Riley, who was unaware of Kirk's true motivations, viewed the transfer as a demotion, as he had previously been transferred up from engineering. Despite Kirk's attempts to protect him, Riley was almost killed by Lenore Karidian, Kodos' daughter, who was attempting to eliminate all survivors of the massacre who could identify Kodos. After surviving the attempt on his life, Riley learned of Kodos' presence on the ship, and attempted to take revenge by killing him with a hand phaser, although he was eventually talked out of the attempt by Kirk.